When Colette first released her pattern range for knits I jumped in feet first, wallet WIDE open and bought both patterns PLUS the sewing with knits book. When her second knit dress pattern came out I bought that too. And then I didn't sew any of the patterns. Hmmm...curious. I'm not sure why this is the case given that I LIVE in knits and the style of both dresses appeals to me. I think there's some tricky (for me) construction elements in the dresses (elastic waist - argh) so I've balked at the thought on embarking down that road. One day...maybe? 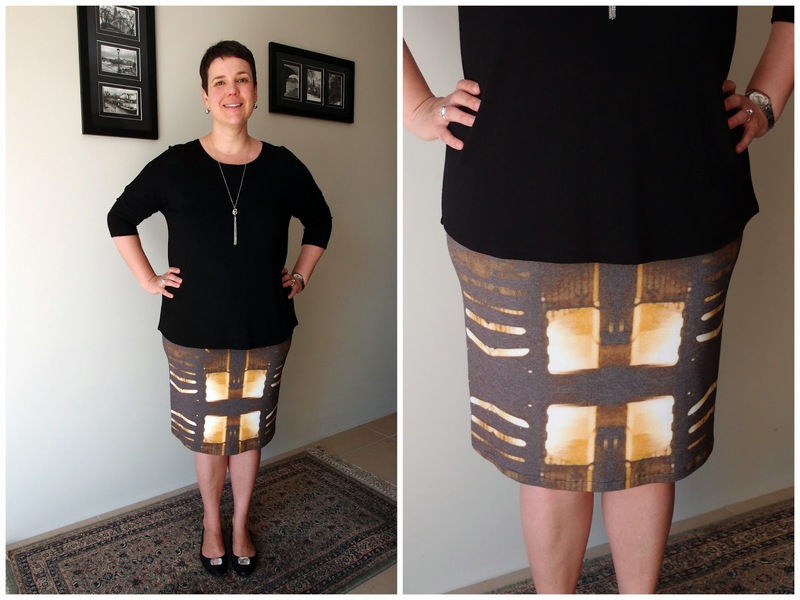 And then one day I was browsing in (you guessed it) Tessuti and saw this digitally printed FABULOUS ponti and I KNEW it'd make a great Mabel Skirt. The pattern calls for less than 1m of fabric so I felt it was OK to splurge on something that a bit fancy. At $49/m this is definitely the MOST expensive fabric I've ever bought...but then I have similar RTW skirts in my wardrobe that I've paid more for so justified it is. I love when a good self-enable when it comes to shopping. I have tried to make a similar skirt to this without a pattern (twice) and let's just say epic fail doesn't even cover how wrong I went. Overall I think this is a pretty good pattern for me - the fit is pretty good and it's super simple to sew. I will definitely be making a few more of these babies that's for sure. I already have two more versions swimming around in my head. The Mabel pattern comes with three variations - version A being the most simple. That said it's UBER mini so I had to lengthen it by a whopping by 15cms (I'm just under 5ft 8"). 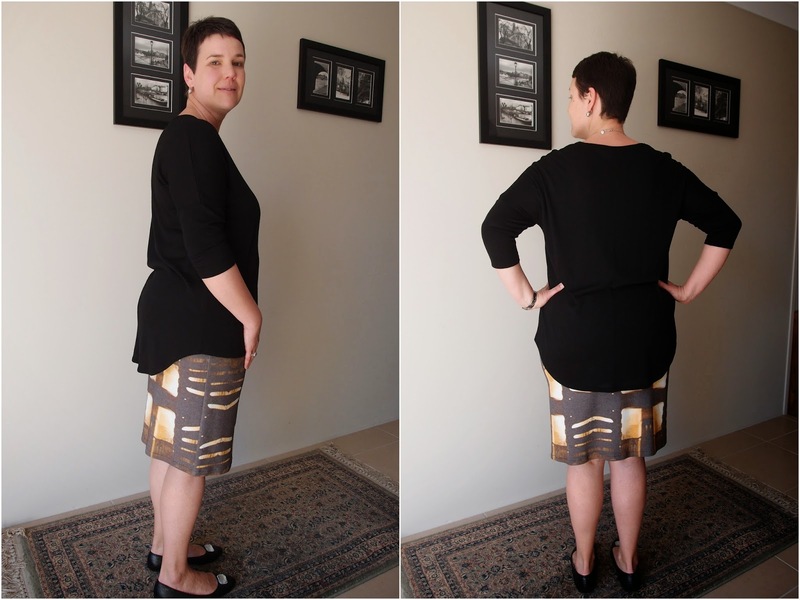 I used one of my existing RTW ponti skirts to make sure I got the length spot on. Before hacking into my fancy fabric I actually made a toile *gasp*. The waistband on the toile was a bit "too comfy" (aka loose) and the pattern doesn't include any elastic and relies on negative ease (and big guts I'm guessing) to hold this baby up. I made a straight XL and the waistband wasn't going to last the day with me, let alone 5 minutes. I tried make the waistband a size smaller but it was still not snug enough for my liking. Noone needs a pants-dropping incident in the office let me tell you. I thought I could try adding some clear elastic into the waistband as a means of offering some support and I'm so happy to report that this actually worked. I recut the waistband to a size XL and overlocked the elastic to the inside of the waistband and then topstitched it down to ensure it didn't move around. Hurrah! It took me a few goes to get this right but I'm totally owning overlocking clear elastic now. My only issue with this pattern...or probably the fabric was that no matter how I laid out the skirt I was going to have either bright arrows and glowing squares pointing to my "lady parts" and on my caboose. I probably should've thought about pattern placement before I laid down my big wad of cash, hey? Ooops. We've jokingly called this dress the "flaming V-jay-jay dress" at home and I think you can see why. I'm super happy with this skirt. It's perhaps a little tight over my hips and bum, but I have big hips and a big bum and I'm totally fine with that. It fits no differently than my RTW skirts and I would always wear a longer top over a skirt like this...so I'm happy. So, confession time. What's the most you've ever spent on a meter or yard of fabric? I like it a lot! I don't think it's too flaming vajayjay either, you definitely pull it off. I'm just a beginner in the dressmaking front at the moment, so haven't dropped too much cash on fabric yet. Although I used to have a little side business making bunting, and would often spend up to £14 a metre on quilting cottons. I have no idea why I thought that was a good idea, but there you go! I think the longer top makes the pattern a bit more subtle. I hope! I recently bought another nice & expensive piece of fabric for a dress AND it shrunk in the wash so the dress is a no-go. I cannot justify forking out more cash to make the pattern fit when I'm just a novice sewist. You live and you learn. Thanks for your kind words (and for visiting my blog)! It's great fabric isn't it...now we just need some warmer weather here so I can wear it with bare legs. This looks so great especially with that top. Great balance. The most expensive fabric I ever bought was $79 but I manage to completely stuff it up. Typical. I bought an embroidered and beaded net earlier this year for a cocktail dress... it was 'one hundred and something i'm not looking at' dollars, and i was so nervous sewing it up, but pretty happy with the end result. I love this on you, just lovely! I love that you are using advance techniques like overlocking on clear elastic - you go girl!! Hmmm most expensive fabric? 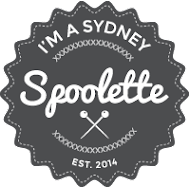 I must admit I am a bit of a tight arse with fabric and rarely spend more than about $25/m! "Advanced techniques"! You're too kind. Thank you so much! I'm glad your dress turned out -- that must've been quite stressful I'm sure! Thanks Kirsty! Bummer that you're expensive fabric didn't work out...sewing is such a hit & miss thing for me (mostly miss, you know). Wowzers, $125! What did you make with it? 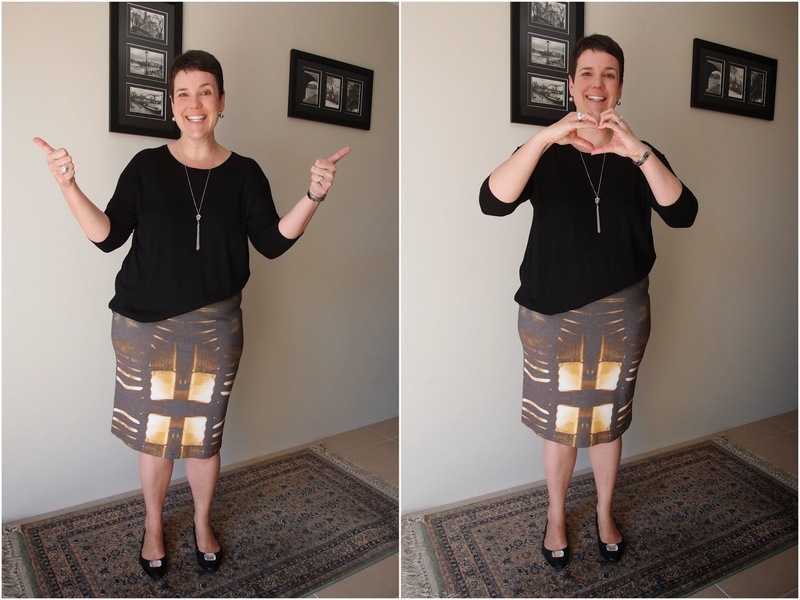 This skirt is SOOOO easy, perfect for beginners like us!